Here are testimonies from four couples who were recommended for each other by Susan Crosthwaite. The two were recommended for each other in 1998. Moi Eng was 39 years old at the time. “For Mooi Eng, after some earlier disappointment, to reach a point of accepting a suggested matching is not an easy road. I had not been matched previously, but I did have my own “baggage”, and no guarantees came with me. Our separation course, being a lot shorter than others I know of, had it trials, yet it was those that helped us keep connected. We are very different people, culturally and mentally, and perhaps we will not always agree. Jean Luc Ngama & Jana R.
He is from the Congo (a refugee and now resident in the United Kingdom) and she is from the Czech Republic. They are ‘Jacob’ children. Jean Luc had been matched twice before and had been a candidate for over four years. Pedro C. and Veronika T.
Pedro and Veronika were introduced to each other and Blessed in 2012. Pedro is a Jacob child whose parents were Blessed when he was 4 years old, began serious spiritual devotion in 2006 when he was 18 years old and applied for the matching in October 2009. He went through introductions twice, including a ‘heavenly courtship’ which lasted 6 months in 2010 – 2011. 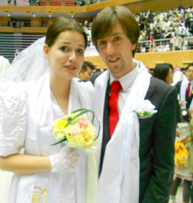 Veronika joined CARP in Czech Republic during 2006 and applied for the matching in September 2010. This was her first introduction. I remember how serious Pedro was during their courtship and the 40 days of separation after the Blessing to read True Father’s speeches as a way to prepare for their life together. I was very serious when preparing for matching and I tried to set up many meaningful conditions that would be at the same time good for my personal development. It took me some time to even decide for it, so after I decided I was trying to use everything that came as an opportunity to prepare myself for my future partner. After one and half years of waiting it came and it was intense. I felt connected with Pedro somehow from the beginning. When we were introduced, I was so nervous and emotional. We were at a European-wide meeting and were introduced very soon after seeing each other’s profiles. Still when I think back, I remember that it was for me like a miracle to meet Pedro, our lives and personalities were in some way sooo similar, but at the same time different… .After a few days of skype meetings I felt that I am sure about going for matching with Pedro. It was very romantic time skyping with Pedro. And now we are living together in Prague and we went through many ups and downs already, but I can see that it makes our relationship stronger and represents the first building blocks of our blessed family life. Even it is not always easy, I really love Pedro and feel strongly that he is huge blessing given to me for which I am very grateful to God. My preparation for matching was done mostly through prayer but also through the development of my qualities so that I could be a good partner. Being introduced was a beautiful and intense experience, it seemed like we had known each other for a long time. During our 21 day “Heavenly Courtship” period, we communicated mostly through skype and email and now we are living in Prague and working with CARP, we love each other very much and we hope to bring an exemplary family in the future. Jozsef O. and Hajnalka C.
In February 2011 the Hungarian NL, Tibor Krebz recommended Joseph, and sent me the advocate’s page, including this explanation, “he was a soldier in Iraq 1.5 years and for more than half a year his unit was lost in the war and cut off from their HQ; they had to survive by themselves during that time. After Iraq he started to work and since that time has been an official bodyguard here in Hungary, protecting the very high level political leaders and other famous pop musicians and religious leaders who visited Hungary. He was blessed in 1995 but soon after his Blessing, his visa expired and the Romanian government did not extend it for him. So he could not leave Romania officially for 2 years. During this time his fiancée gave up the Blessing. A few years later he could get a visa and managed his settlement in Hungary and now he is a Hungarian citizen. In 2006 he had a car accident (he was passenger in the car) and for one and a half weeks was in a Coma; being on a breathing apparatus for 18 months after which it took several years to recover his health. I met Hajni in 2006 when Ashley and I visited Hungary for a couples’ seminar; she regularly witnessed with the Hungarian members, and served the families in various ways, even though her own Blessing relationship broke down in tragic ways in the early 2000’s. She courageously kept going with love and faith. 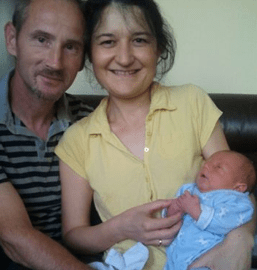 One day in 2010 Hajni saw Joszef in the city square, remembering him from earlier days, and invited him to come to their ‘Peace House’; he rejoined the FFWPU. About a year later the Hungarian National Leader and BFD Rep. recommended to me that they would make a beautiful couple, so we ‘prayed over it’ and decided to introduce them. A few months ago they sent me the above beautiful photograph with their baby son!